As they were leaving, one of the men said, “We believe the Bible proves itself.” As they were already halfway out the door, I didn’t get to ask for more info on this remarkable claim. However, I have thought about this frequently since this episode, wondering just what he meant by his statement. Finally, it dawned on me that I could probably get a pretty good idea about what he meant by simply googling the question,” Does the Bible Prove itself?” Most of the sources Google turned up dealt with the question of whether and how we can know that the Bible is the word of god. There were many, many answers, some claiming it is the word of god and we can know it, and some claiming it just ain’t so. Of those which answered in the affirmative, I found two sources especially interesting. One was titled “Authority of the Bible,” by Pat Zukeran of Prime Ministries, which I may write on later, and the other was “How Do We Know that the Bible is True?” by Dr. Jason Lisle at Answers in Genesis. This later essay was quite amusing and peculiar in the way the author began with a cogent, very reasonable argument and then . . . well, you’ll see. Dr. Lisle begins his essay with an intelligent overview of failed attempts to answer the question. We can’t just take it on faith that the Bible is the word of god, he says, nor can we rely on the fact that the Bible itself says it’s all true, and the fact that it changes lives is beside the point. He also says that while archeology seems to have proven some of the Bible’s claims, it hasn’t proved all of them. Similarly, many claims of the Bible appear to agree with what we take as scientific fact, but science itself is a tool of man, and so is fallible. So far, so good. This guy has done an excellent job of pointing out many of the errors of standard Christian approaches to proving the truth of the Bible. So, Lisle’s answer? He writes, “If we are to know for certain that the Bible is true, we will need a different kind of argument - one that is absolutely conclusive and irrefutable.” Wow! This got my attention! What if we don’t accept his presupposition that the Bible is true?Did you get that? He says that what proves the Bible is true is the fact that if it isn’t true, then we can never prove anything. So, if the Bible is true, then we get to know some things for certain, but is that reason enough to believe the Bible is true? Because it would give us something we wish to be true? Isn’t that what we call wishful thinking? Don’t we have some pretty sloppy thinking here? Has he made any case at all for the Bible being true – other than that is what he wishes? And, in the end, isn’t he just saying that the only way to know that the Bible is true is to assume it’s true (since to “presuppose” means to assume)? So, do you suppose he ever considered the alternative? What if we don’t accept his presupposition that the Bible is true? Where does that leave us? Well, according to Dr. Lisle, then we can never be sure of anything. I don’t know about you, but that isn’t such a huge problem for me. Science has pretty much shown us that we can never be absolutely sure of anything – except by definition. Scientific theories are constantly refined by further knowledge, but look at all we have done with that imperfect knowledge! How certain we can be of anything is always a matter of a sliding scale of probabilities. So what? But, why would anyone “presuppose” the Bible is the word of god anyway when it has clear and obvious contradictions. There are many, of course, but my favorite is the two different creation stories in Genesis. In one, man is created before the animals, and in the other, man is created after the animals. I’m pretty sure that those two stories can’t both be true. Even if, as Dr. Lisle says, we can’t be certain of anything unless we presuppose the truth of the Bible, I think we can be sure enough in this case to make a pretty secure judgment. Dr. Lisle’s is the most creative approach to “proving” the truth of the Bible that I have yet come across, but I doubt it’s the one which convinced those two young men. As this skeptic sees it, his argument depends entirely on a false and rather foolish assumption, mere wishful thinking, and it leaves me seriously hungry for some common sense. 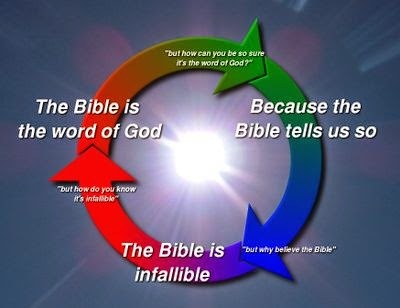 ExChristian.Net: Does the Bible Prove Itself?